The bottles have been capped, and the Tap Room has it tapped! February marks their annual ode to one of craft beer's finest virtues - the spirit of collaboration. After Vinnie Calurzo of Russian River Brewing and Adam Avery struck up a friendship, they realized that their love for brewing fine craft beers was not the only thing they had in common... they also both made a beer named "Salvation"! 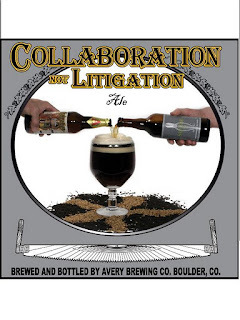 Rather than calling the lawyers to duke it out, they decided instead to keep selling their Salvations AND blend the two into this very special Belgian ale. The unified result is a showcase of spicy pepper phenols and dark fruity esters.